Southampton TUSC Anti-cuts campaigners across Southampton calling on Southampton Labour council to use its cash reserves and borrowing powers to set a legal, balanced, NO CUTS budget in 2016. Fighting to restore government funding to Southampton City Council to provide all services the city needs! 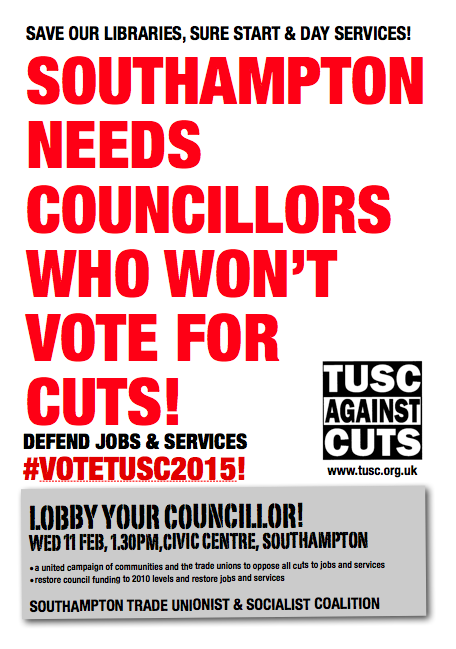 Southampton needs councillors who won’t vote for cuts! Local Tory councilor Allan Glass recently suggested we shouldn’t spend more than we earn. What advice to give to a city with an expanding trade in food banks and payday loans due to his governments savage attack on wages that have shrunk by 9% since 2008. For the rich friends of this government, and the millionaires in parliament, their problems amount to how to spend all their soaring wealth. Inequality is no accident but a direct result of the conscious policies of this government that has made ordinary people pay for the bailout of the banks and this stagnating economic system, that provides a boom for billionaires, the 1% and growing misery for the rest. Walk down Southampton precinct past West Quay, global brands staffed by workers on low pay and zero hour contracts, that make huge profits yet escape and evade paying taxes. The Trade Unionist & Socialist Coalition rejects the inevitability of this, unlike Labour’s MPs and their councillors who remained silent as cuts were made then dutifully swung the Tory axe on the council since taking power in 2012. Austerity has failed and must be rejected. The people of Greece have shown the way, placing their hopes in Syriza. TUSC is standing in May’s elections to do the same. To offer an alternative that uses the wealth created by working people to provide the jobs, affordable housing, a living wage and public services we need. We give our full support to anti-cuts councilors Keith Morrell and Don Thomas in voting against council cuts and call on Labour councillors to show their mettle and do the same. Just three months from a new government, why inflict more damage on the city, if you intend to reverse the cuts made since 2010? We need MPs and councillors who will fight for the 99%, TUSC will. 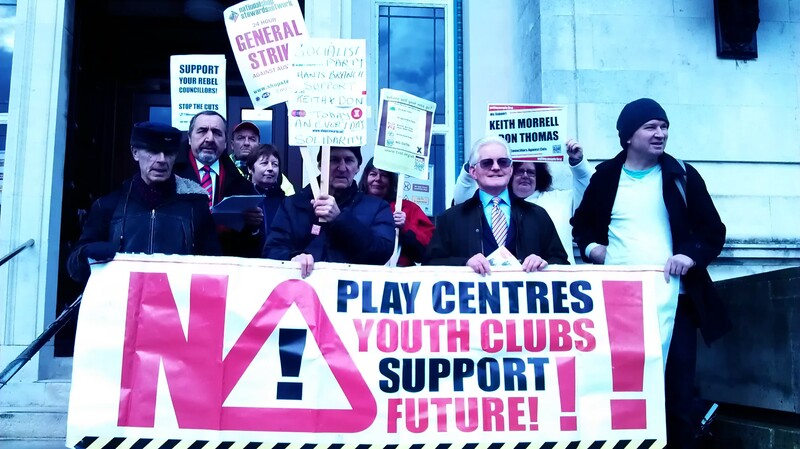 Anti-cuts campaigners, trade unionists and socialists calling on Southampton Labour council to use its cash reserves and prudential borrowing powers, to set a legal, balanced, NO CUTS budget in 2016! Campaign to restore government funding to provide jobs, housing and £10/NOW for all.